Home : Maplesoft Books : Getting Started with Maple, 3rd ed. The purpose of this guide is to give a quick introduction on how to use Maple. It primarily covers Maple 12, although most of the guide will work with earlier versions of Maple. Also, throughout this guide, we will be suggesting tips and diagnosing common problems that users are likely to encounter. This should make the learning process smoother. 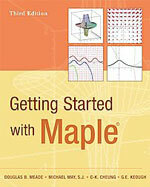 This guide is designed as a self-study tutorial to learn Maple. Our emphasis is on getting you quickly "up to speed." This guide can also be used as a supplement (or reference) for students taking a mathematics (or science) course that requirse use of Maple, such as Calculus, Multivariate Calculus, Advanced Calculus, Linear Algebra, Discrete Mathematics, Modeling, or Statistics. Chapter 1 gives a short demonstration of what you'll see in the remaining parts of the Guide. Chapters 2 through 11 contain the basic information that almost every user of Maple should know. Chapters 12 through 15 demonstrate Maple's capabilities for single-variable calculus. This includes working with derivatives, integrals, series and differential equations. Chapters 16 through 21 cover topics of multivariate calculus. Here you'll find the discussion focusing on partial derivatives, multiple integrals, vectors, vector fields, and line and surface integrals. Chapters 22 and 23 introduce the statistical capabilities of Maple. Chaptesr 24 through 27 address a collection of topics ranging from animation and simulation to programming, and list processing. Two appendices explain how to learn more about Calculus and a quick reference guide. Each chapter of the Guide has been structured around an area of undergraduate mathematics. Each moves quickly to define relevant commands, address their syntax, and provide basic examples. Here, you'll find more technical examples or items that address more mathematical points. This section contains some simple pointers that all Maple users eventually learn. We've drawn them from our experiences in teaching undergraduates how to use Maple. Here we present a question and answer dialogue on common problems and error messages. You'll also be able to find out how certain commands work or what they assume you know in using them. Many useful topics are covered here.